Masterpiece-Weekly Photo Challenge – Dancing in the rain! Masterpiece. No matter where you are (and where you’ve been), I’m certain you’ve stumbled upon something extraordinary: a place that blows your mind; a work of art or object that speaks to you; or even a location or scene that’s special, unusual, or even magical in some way.I immediately think of Spanish architect Antoni Gaudí’s unfinished masterpiece, the Sagrada Familiain Barcelona — and its awe-inspiring ceiling in particular (pictured above). I remember the sight to be truly jaw-dropping, as if birthed not from the human mind, but rather something otherworldly.For this challenge, get creative. Reach far. And remember that “masterpiece” can mean many things. We want to see awesome sites you’ve discovered, fantastic things you’ve come upon, wondrous moments you’ve captured, and more.IN A NEW POST CREATED SPECIFICALLY FOR THIS CHALLENGE, SHARE A PICTURE OF A MASTERPIECE. 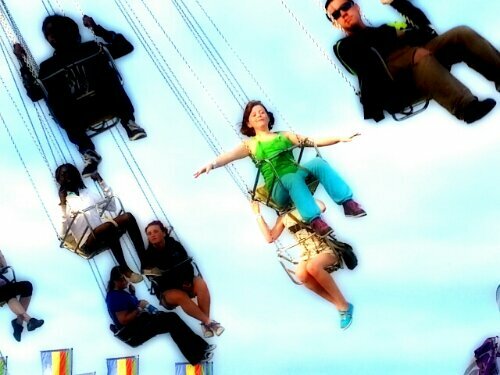 I think this photo of my daughter Haley (in green) captures a wonderous moment at the fair this weekend. She feels free and like she is flying. It is childlike uninhibited enthusiasm. I love it! !